 Now available here: the KaufKauf Shoppingmanager™ - of course completely free! and last but not least: you save money because shopping can be done more single-minded due to the exact and detailed shopping list now! Or the annoying version: You are looking forward to have a bag of chips for your TV evening, are absolutely sure there must be at least one, you find it ... and it is outdated, you can't eat it any more. All these things don't have to happen any longer: using the KaufKauf Shoppingmanager™ you can automate all the steps and operations for managing your inventory. This system is able to keep information of all your stock and inventory. As soon as you take something out of the stock that is required it is put to your shopping list automatically. And if you want to have a look what you currently own that is also possible online or via mobile phone - so practically you can have a look into your larder from anywhere just to find out what is in there! And if there are some products near its best before date you get a warning - early enough to use them up. So KaufKauf is much more than only an automated shopping list, it is an extensive shopping guardian! To use the KaufKauf Shoppingmanager™ not very much is needed: an Internet-capable computer (which doesn't needs to be turned on all the time, that's what we're doing for you!) and a printer and/or a Internet-capable mobile phone. Management of your products is done really simple: the easy to use KaufKauf-Software - where you can see a screen shot right beside here - also supports barcode scanners, you can use to scan the codes of your products, completely without the need to enter them all manually! The collection of known barcodes and the collection of your specific barcodes is growing continuously so that the usage of the KaufKauf Shoppingmanager™ becomes more and more comfortable over the time! And for technically interested people there is the possibility to run this application on e.g. a Panel-PC that can be mounted within your kitchen or larder. This PC can be used very simple via a touch display. To do that we offer a fully configured Linux system that is optimized and prepared to run on such a Panel-PC: details and more information about that system can be found here.